Get $155 in product for $99? Tell me more about the Starter Kit Special. Ends May 30. 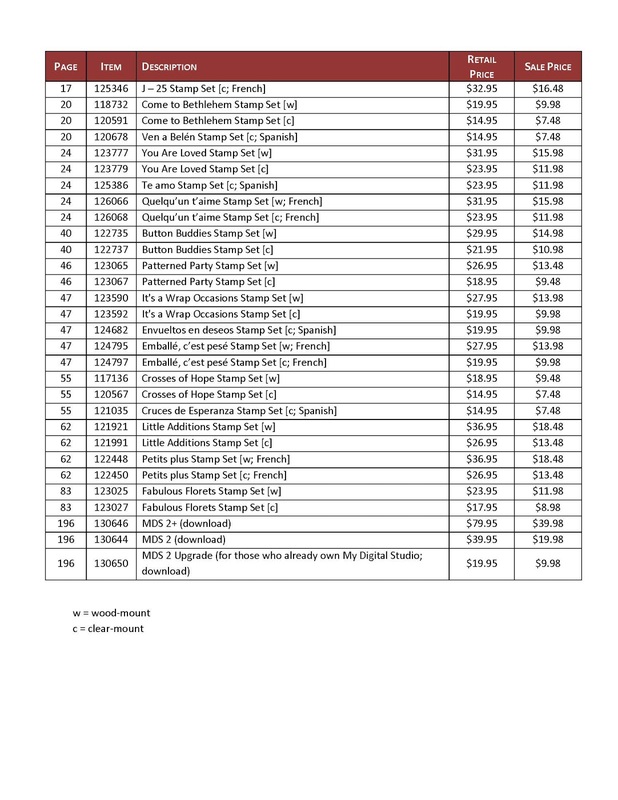 Retiring Products Lists. Hundreds of stamps and accessories from the 2012-2013 catalogs are retiring. Many products are only available while supplies last, so be sure to get your orders in early. May 1 - June 15: 25% OFF My Digital Studio Content & Print Pricing. Dolled-Up Birthday Card Kit. Everything you need to make 6 cards. NEW! Bloomin' Bouquet Project Kit. Contains the material to create thirteen beautiful flowers. Stampin' Up! Color Refresh. 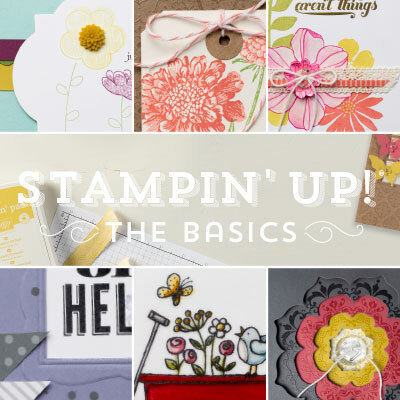 It's time to spruce up the Stampin' Up! Color line up and stay in step with the hottest fashion and home décor trends. Coming 5/31. Stampin' Up! Wood-Mount Cases. Improved Stampin' Up! Basic Black Classic Stampin' Pad. 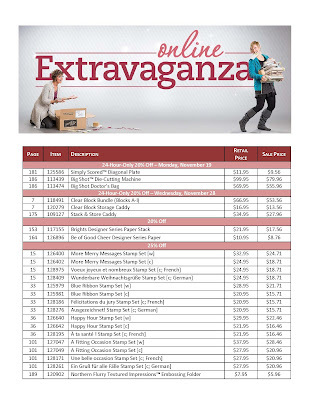 March 15 - May 30, 2013: New Catalog Sneak Peek! Spring Surprise Promotion. 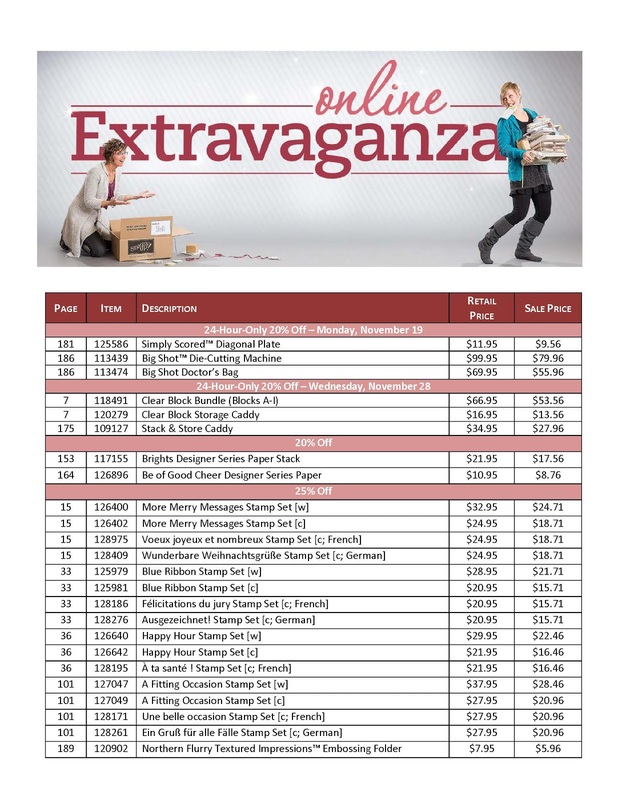 Here's your chance to purchase new product from the 2013-2014 annual catalog. NEW PRODUCT! Stampin' Up! Photopolymer Clear Stamps. Perfect placement and great cling. I'm IN! 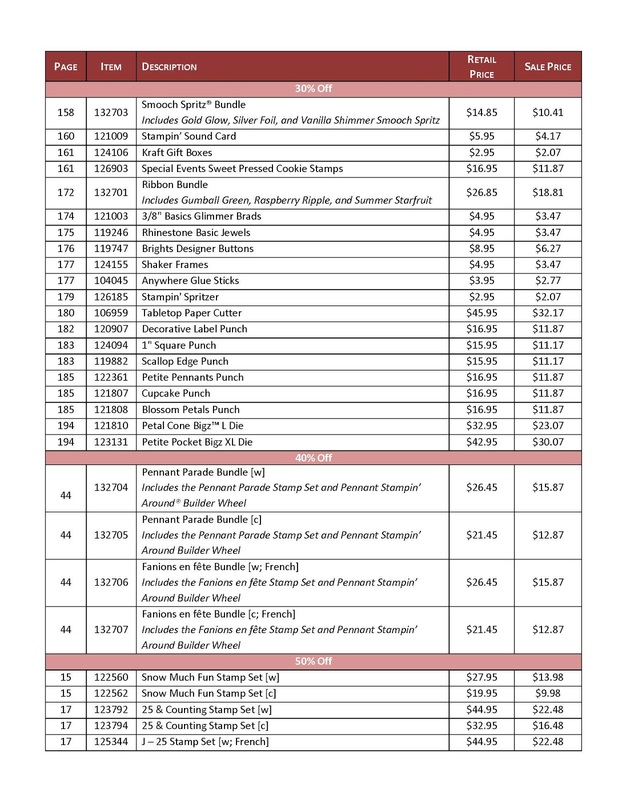 $30 in FREE Product from Stampin' Up! 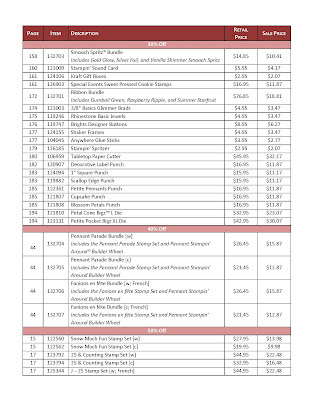 $30 More in Your Starter Kit from Stampin’ Up! Click here to head over to my online store and start shopping! The Offer: You’ll get an extra $30 for your Starter Kit! That means you will get to choose $155 worth of ANY products you’d like for only $99! For more information about joining my team as a Demonstrator, click here. STAMPIN' UP! INTRODUCES IT'S FIRST PHOTOPOLYMER CLEAR STAMP SET! Want perfect placement? I'm so thrilled that Stampin' Up! is testing the market with their new, transparent photopolymer stamps. My Designer Typeset Clear Stamp Set (the first release, 57 pieces) is already on the way! Stampin' Up! will introduce a new photopolymer stamp set each month! These stamps will be in addition to our wood and clear-mount stamp line. The top-quality photopolymer has just enough give to create a perfectly stamped image every time and is well-suited for our firm-foam pads. Watch this fun Stampin' Up! Photopolymer Stamp Set Video. March "Best of" Flowers Collection (#133342, $14.95). Order it now! NEW MARCH FLOWERS "BEST OF 25 YEARS" STAMP SET! Great timing for Spring and Mother's Day! Available NOW! Collect 6 "Best of" stamp sets and get a FREE stamp set valued to $14.95. Introducing On-Line Classes from Stampin' Up! 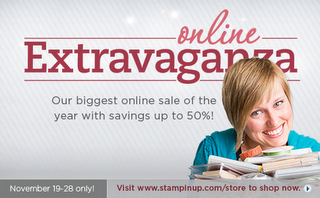 I am so excited -- Stampin' UP just announced a new series of on-line classes that are perfect for the busy stamper! Whether you're too busy to make it to classes at my Studio, live too far away to attend, or attend every class but still want MORE stamping inspiration.... THIS CLASS IS FOR YOU! Learn innovative ways to get the most out of your supplies (from stamps to the Big Shot) with clever tips and all the techniques you need to start creating with success. Produced by Stampin' Up! and starring Stampin' Up! Staff, this class is a HOME RUN! You will NOT want to miss it! The content for the price is amazing. It's easy to order - I've even put together a quick video that will walk you through the entire ordering/set-up process. It's really easy-peasy! Order now via my on-line store for just $14.95! The price of the class is $14.95 and there is no shipping charged as it is a download. 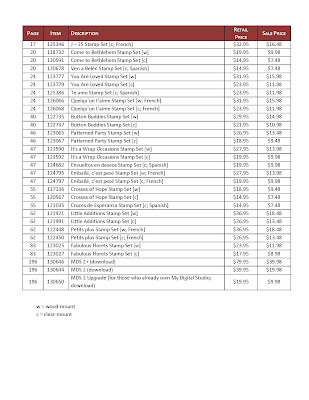 THESE ARE DOWNLOADABLE ZIP FILES. It will look like you need My Digital Studio to open them but YOU DO NOT NEED MY DIGITAL STUDIO TO TAKE ADVANTAGE OF THE CLASS! When downloading after purchase, just make sure to select "For other applications" rather than "For My Digital Studio and proceed from there. After purchasing and downloading the class, open "Stampin' Class--The Basics" folder and there will be 6 individual "sessions" folders inside. Click on each and enjoy! Check out what else is on sale today through November 28th. Then on the final day, November 28th there is another one day only special on selected items! Shop HERE or e-mail me so you don't miss out! Get everything you need to make six cards! If six isn't enough, add Note Cards (#107311, $5.95 for 20) to your order - we've already included extra rhinestones in the Fancy Friends kit. Stamp "Friends" in Daffodil Delight or Old Olive ink on the front of the card. Adhere the flowers to the card. Adhere Rhinestone Basic Jewels to the center of the flowers. Would YOU Like to Pick the Next Kit? We want your kit ideas for upcoming kits. YOU will be the inspiration for the kits and YOU will vote to decide which project will be sold. Submit a Project is not limited to demonstrators - anyone can submit ideas and vote on upcoming kits. Start creating! Send us your kit ideas and get ready to vote for your favorites. 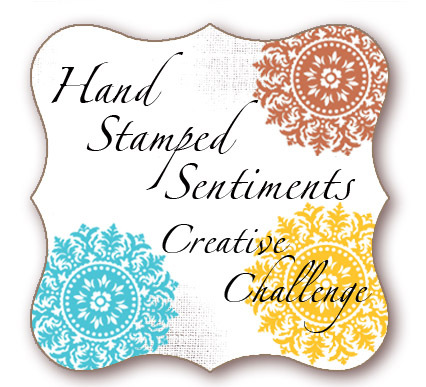 I'm so happy to be back and offering creative classes again in my Stampin' Studio! I have so missed all of you and stamping and creating together, so I've put together a Christmas Card Class. These cards are fun and super easy and fast to make! Join me for the Christmas Card Class and you'll have a joyful time hand making your Christmas cards for friends, family, neighbors, teacher and all those on your list this year! I'm offering this class on three separate dates (above). The fee for the class is $25 for one set of Christmas Cards (4 each of 5 designs), a Petite Pocket treat/gift card holder & all supplies. Festival of Prints Designer Series Paper Stack (48 sheets in the pad: 4 each of 12 double-sided designs, a $6.95 value). You will be taking home 35+ sheets of the paper stack for other projects to create! Snow Festival Designer Printed Tags (25 double-sided tags: 5 each of 5 double-sided designs, a $3.95 value). You take home any extras! Space is limited ~ Please contact me now to register for the class or to schedule a class especially for you and your friends! *Make it a girl's night and bring a friend! Or call me to schedule your own studio time with your group! The content in this blog is the sole responsibility of Cherylin Peetz as an independent Stampin' Up! demonstrator and the use of, and content of, the classes, services or products offered on this blog is not endorsed by Stampin' Up! Images Copyright Stampin' Up! 1990-2011 (unless otherwise noted). Simple theme. Powered by Blogger.